We have been writing this Social Justice series long enough to witness a wide variety in the types of social media outrage stories that flare up weekly. Very often, the brand that is the target of the social mob’s anger just needs to wait out the storm, be careful not to fan the flames, and let the story exhaust itself (think Chipotle fake twitter hack). Sometimes, organizations are hit so hard that they stumble to recover as in the case of the Susan G. Komen Foundation. It appears more rare to find a brand that quickly changes to its practices after a social media storm; too often organizations are paralyzed during the height of a backlash. Last week my friend Lisa Gerber of Big Leap Creative asked for examples of companies who had done just that and I realized how many I could name off the top of my head. Then, like a blogging gift from the social media sphere, the Children’s Place Story reared its head. Normally, I try to stay as objective as possible in this series, but I must confess that I have long been a fan of The Children’s Place; I have dressed my 6 year old in their clothes for her entire life. The primary reason they are my go-to store is that most of their clothes LOOK like they’re for little girls – you won’t find spandex and those too grown up looks in their stores. Secondly, their clothes last a long time. She rarely wears them out and they are passed down to her younger cousins. And I like their graphic tees; they’re cotton, they’re cute, and they’re affordable. In addition, the company has a Social Responsibility platform that is admirable and particularly important in the apparel industry. All brands make mistakes at some point, and I was not surprised at all by the negative reaction to their Best Subject Tees. The Children’s Place is well known for its cute graphics t shirts for girls and boys; for many parents these inexpensive shirts are a staple of back to school shopping. As Back to School shopping is at its height this week, timing couldn’t have been worse for the outrage that flared up over TCP’s Best Subjects designs that indicated that girls did not want to or couldn’t be good at math. 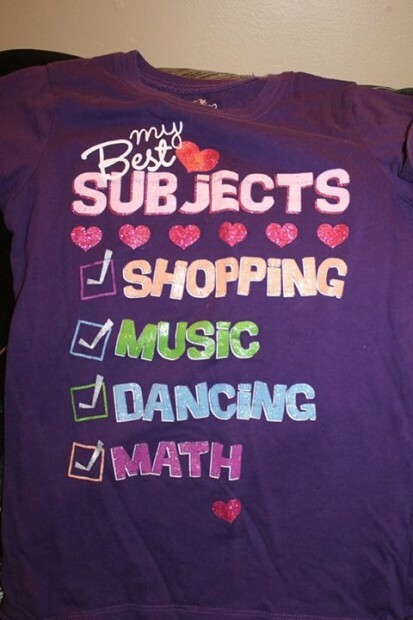 RE: Best Subject tshirt – How DARE you perpetuate the myth that girls can’t do math! My daughter is brilliant at math, reading, science, music, dance, etc and is not afraid to learn something new or demonstrate independent, bright thinking. Guess what else? She’s also a savvy shopper and won’t be caught dead in your clothes. On that same day, Jezebel published a post called The Children’s Place Selling Some Seriously Wack Shirts to Children, and their comment section shows that their readers were 100% with them on their harsh criticism of The Children’s Place T-shirts. We take feedback from our customers very seriously. It has come to our attention that some of you view our Best Subjects T shirt as insensitive towards girls and women. This was not our intent. There are countless women in all walks of life who excel in math, including our very own CEO. We have pulled this product from our stores and we want to express our apologies to anyone we may have offended. Their less active Twitter Page put the same message out. Rather than apologize to anyone you “may have offended” why not take a stand? Admit sexism has no place in your stores. Facebook, however, tells a very different story. There were posts critical of the shirts before the company decided to pull the Best Subjects shirts, but it’s hard to determine how extensive the anti-TCP clamor was as there is a gap in anything posted by others before August 4th. I am smart. I have a career. I love to shop and dance. Math is DEFINITELY not my favorite subject. Maybe they can make this shirt in adult sizes too. I’m not offended. Teach your children how to brush off comments and rise above steretypes. Learn how to exist without being offended. If the shirt were for boys and it said BASEBALL, FOOTBALL,VIDEOGAMES…would you be so quick to boycott? If not…you’re a sexist too! So as a loyal customer, can I complain or give feedback to all the over sensitive people who complained about the t-shirt. You should not apologize for something that was not wrong!! If this t-shirt can be offensive, then most shirts with sayings on them could be considered offensive!! For example: it could be offensive to have a shirt say big brother/sister…that could be insensitive to people who have weight problems. I don’t actually feel that way, but it is an example of how anything can be blown out of proportion! Bring the shirt back and tell those people to shop else where! I am outraged because I am sick and tired of everyone else having to bow down to the intolerant hypocrites crowd. If you people don’t like something, you all pitch a fit and gripe and complain and threaten people until they bow to your will. You shriek about tolerance and equality, but if someone has a different point of view than yours, then that person must change to your point of view, because yours is the only right point of view, and nobody else’s point of view means anything. It’s not really about the shirt at this point. It’s about TCP giving in to the intolerant pc crowd, and a lot of people are sick of it. Anyone paying attention to the profession of Marketing and PR knows that the job has become more complex and stressful with the rise of Social Media. Stories have the potential to move at lightening speed, and the giant megaphone that was once solely owned by the profession is now shared with a company’s critics. When a negative story takes hold, those in charge must decide, quickly whether to engage in the debate, ignore the story, or quickly make changes. There is no blue print for how the story will unfold – whether the influential critics will back off and find a new story or stay on the company in an attempt to extract a greater ‘punishment.’ And there is no road map for how a company should react because each case has its own significant details and players. The only advice we can give the next company to come under fire is to make sure that you have experienced PR and social media savvy pros on your leadership team calling the shots. What makes this story different and interesting is what appeared in the comments after The Children’s Place announced that they would no longer be selling the shirts; they got a bit of support from detractors of the shirt, but their regular customers came down hard on them for what they saw as ‘caving in’ by the company to a bunch of intolerant bullies. The people who are angry at the change in direction appear to be The Children’s Place regular customers, and a lot of women are in their ranks to boot. If you read enough of the comments it becomes clear that people weren’t overly supportive of the shirt, they’re just sick of the faceless, vocal social mob calling the shots. Is the Social Media Complaint Space Changing? The Children’s Place has made no additional comments regarding the Best Subjects shirts or their decision to pull them. They have not engaged on Facebook or Twitter with any of the comments that continue to pour in, but one has to assume they are watching this story. Will it change how they react to future, almost inevitable complaints? Are other CMOs and heads of PR watching this story and considering the backlash to the backlash? If they’re not, they should be. This story, like the Paula Deen meltdown and others, shows what just may be a rise in a movement against the Social Media savvy bloggers and campaigners, and the online press carrying so much weight into campaigns criticizing brands.